Marine is a Paris-based illustrator and artist focused on the beauty and fashion industries. You can see her work throughout this month's issue. SS: Tell us a bit about yourself and what you do for a living. 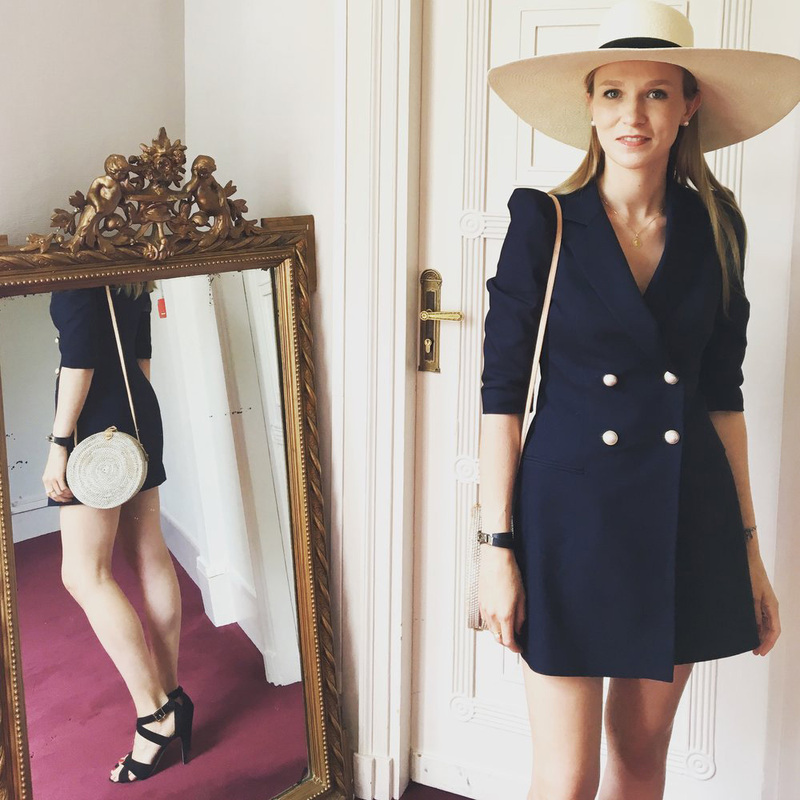 MQ: Hello I am Marine, I am a French Beauty & Fashion illustrator living in Paris. SS: How did you get your start in illustrating? Have you always worked as a professional artist? MQ: I think I understood I wanted to be an illustrator while I was at my university in Paris Penninghen. I was 20 when I had the click. I was doing a lot of fashion illustration inspired by vintage Vogue. When I had my graphic design agency between 2010 and 2013 I already had some of my clients asking me and my associate to do illustration. But I think the true beginning was when I had my first illustration commissioned work in 2014 for the french magazine GRAZIA. I have done with them a collaboration for one year. Every week I had to draw an illustration to illustrate one of their edit. This is how it started. The first drawing I did for them was 2 beauty products. And this is how I started to draw beauty products! I just loved how it looked. From this point I never stopped drawing beauty products. It is like an obsession. SS: You recreate beauty and fashion bloggers "Top Shelf" images through your illustrations. When and why did you decide to do this? 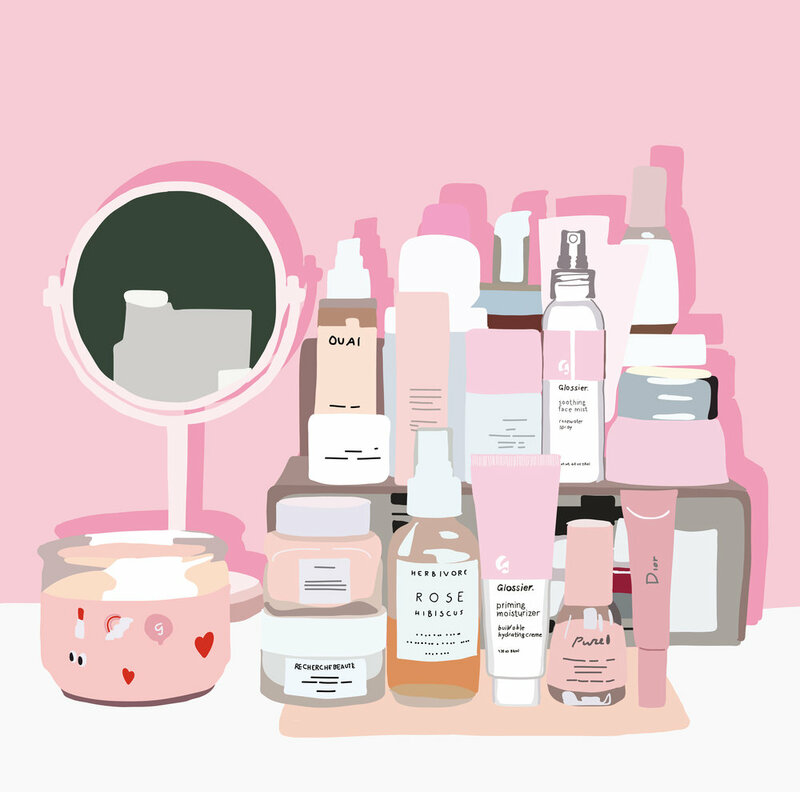 MQ: I started drawing Top Shelf in 2014. the first one I did was called ''my dream shelf'' where i gathered all the beauty products that I would love to own in my bathroom one day. It was more like a goal Top Shelf. A poster I could hang in my bathroom to feel I had all those products. I think that sharing your top shelfs is like a language, with shape and colours. I have an obsession with Top ShelfI am greatly influenced by still life in General and particularly Picasso, Damien Hirst pharmacy shelf, Matisse, Giorgio Morandi… I find there is beauty in everyday life simple objects and particularly beauty products in bathroom. Why beauty shelves? because I adore beauty products, I love to read woman beauty routines on Into The Gloss, I think it so inspiring. I think I love the fact that drawing top shelves is mixing my love for beauty products and my love for still life in Art. My favorite collaborations since then are my collaborations with Goop, L’Oréal, Christian Louboutin, Sephora, Space NK, LVMH, Le Bon toothpaste. SS: Have brands started to take notice of your work? Has it led to paid projects? SS: The theme of this issue is "Influence." Tell us about your own experiences with "influencers," or bloggers, and recreating their work. MQ: I love to recreate influencer top shelf because I think they looks like piece of art most of the time. Beauty products are simple objects but they are full of colours and behind each product you are telling something about you about your skin, about your beliefs and community. It is like a portrait through there top shelf. Influencers loves there pics to be drawn. It is very flattering. Most of the time when I am drawing an influencers or brand top shelf they repost on there IG account. When I see that a drawing is very popular I ask my followers if they would like me to turn the illustration into a poster. I like very much the idea of doing a common piece of art. A collaboration between different actors on Instagram. SS: How has social media helped shape your career? SS: Describe your dream project or client. MQ: My dream clients are Chanel, Diptyque, Dior. I would love to draw and recreate their window displays, or create pieces of creative for their Instagram accounts or maybe collaborate for packagings projects. MQ: I get very inspired by the buildings in Paris, I find them so beautiful, so elegant. Parisian apartments are stunning. If you are looking for me when in Paris you can find me in museums. Most of my free time is dedicated to museums (or cooking French meal). My favorite museums in Paris are: Palais de Tokyo, Le Grand Palais, Le Musée des Arts musée des arts décoratifs, Musée Galleria, Beaubourg. Follow Marine on Instagram or visit her website.